Possibly merged with the Child Service Association. 60 Evergreen Pl. 10th Fl. Receives orphans and half-orphans from two to ten years of age. 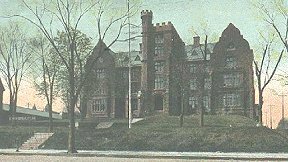 Away back in 1848, the Newark Orphan Asylum as organization for the relief of orphan children was effected, thus making it the oldest orphanage in the county of Essex. Country Home, Westfield NJ to which Home the children are taken about May each year, returning to Newark in October. A Protestant Home for destitute orphans or half-orphans of both sexes. Children received from the ages of two to ten years, subject to the physician's examination. Those able to pay for the admission of children are required to do so up to the maximum of about $4.00 per month for each child. Capacity, 110. Children are generally kept until the age of twelve. Relatives and friends may visit the Home of the First Friday in the month. Legal holidays are not visiting days except by special permission. Children are not sent to public school but are given instruction within the institution. There is no specific industrial or manual training at the Home in Newark. At the Country Home, however, the children are taught farming. YCS Adoption Services Search and Reunion Program offers search services to adoptees 18 years and older, birth parents and siblings who are interested in establishing contact with their natural family and/or obtaining updated medical information. Recently YCS expanded its search capabilities when the program acquired the adoption files of Christian Homes for Children in Hackensack which includes the files of Good Will Home and Rescue Mission in Newark and the Fort Lee Orphanage. These are in addition to the current record base of files from the Protestant Foster Home, Home for Friendless and Newark Home for Foster Care, Newark Orphan Asylum and the Children's Aid Society ­ The Prevention of Cruelty to Children. For more information about this program or to inquire about a search, call 973-395-0801 X417.